A dessert with just 5 mg cholesterol and 3 gr fat? Sure do! Get ready to rock your palate without feeling guilty! Follow the instructions of my Ashta Cream recipe at: How to Make Ashta Cream for Lebanese Desserts:. Remember to refrigerate it. 1- Mix sugar and water, and bring to a boil. 3- Remove from heat, and stir in the orange blossom water. 1- Blend well the Shredded Filo Dough until you get a dough of very tiny grains. 2- Stir the dough in a non-stick casserole, over medium heat, until yellowing, then Increase the heat, stirring continuously. 3- When the dough starts darkening, add the liquid ingredients (water, orange blossom and rosewater), and 1/2 the cup of sugar syrup. 4- Keep stirring for the dough to absorb all the liquid, and homogenize. 5- When the mixture turns into a dark golden brown color, remove from heat. 1- Pour the mixture into the glass serving pan, and spread it well, dabbing it with the dampened palm of your hand. Allow it to cool for 10 minutes. 2- Pour the Ashta cream all over the Mafroukeh mixture. 3- With a spoon, spread it well all over, then press gently for an equal level. Wet the spoon with fresh cold water and smooth a little the surface. Place the serving plate in the fridge to cool. 1- Pour the remaining 1/2 cup of syrup in a serving bowl. 2- Cut the Mafroukeh into 15 equal pieces. 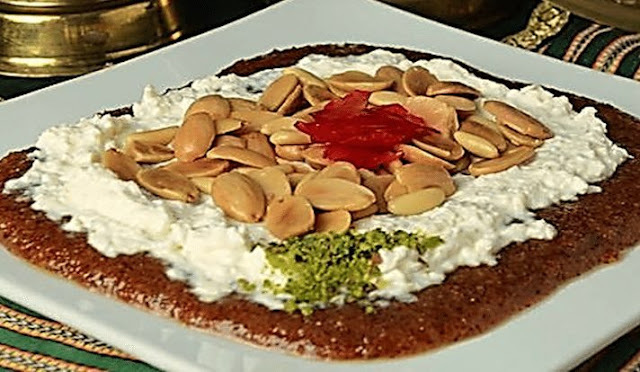 This recipe is intended to be healthier, hence the extra syrup is to be used at the convenience of the guests should they wish a sweeter Mafroukeh. 1- With a film of plastic wrap, cover the inside of small cake molds, extending it out over the borders. 2- Divide the Mafroukeh dough Into the cake molds and press firmly. 3- Divide the Ashta cream into the Mafroukeh molds, press firmly, and refrigerate for about 20 minutes. This will allow the content to adhere well together. 4- One by one, turn the molds upside-down on a serving plate, and remove gently the mold and the plastic wrap. 5- Sprinkle on the Pistachio nuts and top them with the almonds.